July 13, 2018 at 12:10a.m. 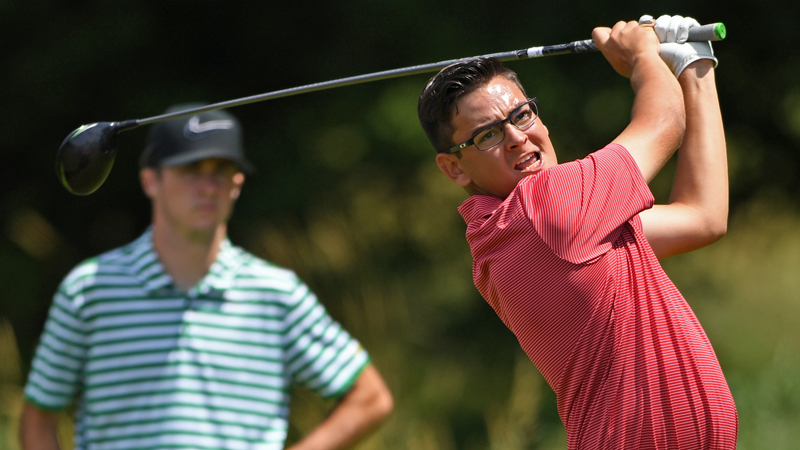 Anthony Clark of Brookfield High School has hovered near the top of each Greatest Golfer of the Valley junior qualifying tournament in which he has participated, yet was unable to earn an automatic berth to this year’s tournament championship. It took extra holes Thursday, but Clark finally punched his ticket on the sixth and final qualifying session, edging Keegan Butler of Cardinal Mooney on the second hole of their playoff at Tam O’Shanter Golf Course. Clark and Butler each carded 75 in regulation — both shot 37 on the front nine and 38 on the back nine — and after both registered par on the first playoff hole, a par by Clark and bogey by Butler on the second hole ended the competition and sent Clark to this year’s championship round, set for July 20-21 at Avalon Lakes Golf Course. Erika Hoover of New Wilmington, Pa., who won the Tam O’Shanter qualifier last year, won her second qualifying event this year after carding 76, 12 strokes ahead of runner-up Madison Horvath of Springfield. Since Hoover has already qualified for the championship, Horvath earned the qualifier nod. In 14-U action, Kaiden Sykes of Salem Hills Golf Course fashioned an 85, one shot better than runner-up Michael Porter of Avalon Lakes to earn his championship invitation. Ryan Sam (87) was two strokes off the pace. Both Porter and Sam have already qualified. In the girls 14-U division, Leah Benson — she also won last year’s event at her home course — won for the second time in three days after shooting 78 while McKenzie Gustas, who also calls Tam O’Shanter her home, was runner-up with 84. Haley Tisone of Tippecanoe Country Club qualified after finishing third with a 99 since both Benson and Gustas have already qualified. Clark, who calls Yankee Run his home course, had a birdie and three, three-putts in regulation, noting that the course was nice to you if you stayed out of trouble. “This course was short, kind of easy and if you were able to hit a decent tee-shot, then you were probably in pretty good shape,” Clark said. “If you didn’t hit a good tee shot, then you found yourself in trouble. Today, I felt like I got off the tee’s well. I had a couple good chips and a few bad ones but overall, I was better short than I was if I had to play long. Hoover’s round included an eagle on No. 10, birdies on Nos. 1, 12 and 17 and 10 pars. “This is my home course so I used it to my advantage,” Hoover said. “If I got in trouble, I knew how to get out and survived holes No. 6 and 9, which are the most challenging. I need to thank my family, friends and golf pro John Kerins for all their help and support. Also, a big thank you goes to my swing coach, Craig Wise. Horvath said her drivers were the most challenging. In addition to Sykes, Porter and Sam qualifying in the 14-U boy’s division, Dom Kapics of Duck Creek Golf Course — he finished tied for fourth with Rocco Turner of Tippecanoe Country Club — also qualified at Pine Lakes on May 6. Benson won three of this year’s six qualifying events and like Hoover, defended her championship from a year ago on her home course. Kerins, Tam O’Shanter PGA Director of Golf, said Thursday’s turnout has been nothing short of tremendous. September 5, 2018 3:12 p.m.
June 16, 2017 12:10 a.m.